The global brachytherapy devices market has numerous players operating both at the global and local level. This makes the market highly fragmented as well as competitive. To establish a stronghold in such a tough market, keen companies are leveraging multi-pronged strategies. One of them is carefully-considered collaborations to expand into new regions and harness greater resources. Such a trend is expected to make the market consolidated in the near future. Another key strategy of players is product development. They are seen increasing allocation on research and development to come up with more effective products. Some of the prominent participants in the global market for brachytherapy devices are Varian Medical Systems, Elekta, CR Bard, Eckert and Zieglar BEBIG, and Theragenics. The market for brachytherapy devices is expected to clock a 4.2% CAGR from 2017 to 2022, predicts a report by Transparency Market Research. Expanding at this pace, the market is projected to attain a value of US$383.7 mn by 2022-end from US$313 mn in 2017. In terms of techniques, the market for brachytherapy devices worldwide can be broadly split into high dose rate and low dose rate. Among them, the segment of high dose rate accounts for a dominant share in the market. Regionally, Latin America, North America, Europe, Asia Pacific, Japan, Asia Pacific except Japan, and the Middle East and Africa are some the prominent segments that have been studied in the TMR report. Of these, North America is a leading market, which going forward will retain its position by expanding at a CAGR of 4.7% over the course of the forecast period starting from 2017 and ending in 2022. The main USP of brachytherapy devices is that they provide accurate, highly localized doses of radiation. As a result, it steals a march over other radiation therapies that affect adjacent areas too. Brachytherapy devices are typically used in high precision treatment of small tumors, mostly found in early stages. Besides, cancer patients treated with brachytherapy devices show limited possibility of recurrence of the condition. In addition, they help to bring down both time and cost of treatment. All the aforementioned benefits of brachytherapy devices is fuelling their demand. “Increasing knowledge about the different advantages of brachytherapy devices among healthcare practitioners would work in favor of the market in the next few years,” explains the lead analyst of the TMR report. He adds, “In the next couple of years, the market could benefit from the swift progress in the field of image guided procedures and radiation dose delivery.” Growing range of products with 3D treatment planning technology to facilitate accurate treatment is also expected to stoke growth in the market. Soaring popularity of medical tourism, in which patients travel to other regions for better or cost-effective treatment, or both, is predicted to catalyze growth in the market too, along with emergence of innovative products, namely electronic brachytherapy devices. 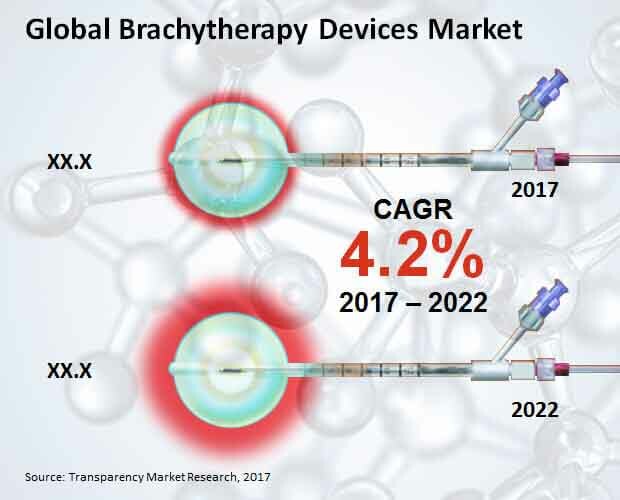 The growth rate in the global market for brachytherapy devices will however be stymied on account of upcoming external radiation treatment methodologies. Concerns pertaining to procurement, storage, and handling of radiation sources are also posing a challenge to market.